Inside the Waukegan Walmart Vision Center, Dr. Wexler performs complete diabetic eye examinations that include a thorough retina evaluation. Also, all other aspects of the eye are evaluated as diabetes can affect the tear glands, cornea, iris, muscles that control eye movement, the pupils, and the inner ocular lens We take diabetes and the eyes seriously, and we want you to be actively involved in your diabetes management. Diabetes can affect the eyes and is the leading cause of blindness between 22 and 77 years of age. The prevalence of diabetes (type II) is higher in the African American and Hispanic population. However, diabetes affects all racial populations and unfortunately is on the rise, especially in younger people. It is important, in addition to regular evaluation by the primary care doctor or endocrinologist, that the eye health and vision be examined annually. We encourage annual dental examinations as well through a dentist. Diabetic retinopathy can develop inside the back of the eye at the level of the retina resulting in damage to its blood vessels. The vessels leak blood and other fluids that can cause swelling of the retina and affect peripheral and central vision. In advanced cases, unwanted new blood vessel growth can occur causing glaucoma, bleeding outside the retina and retinal tears. Retinopathy usually affects both eyes. The longer a person has diabetes, the more likely the person will develop some form of diabetic retinopathy. Also, people are more at risk for diabetic retinopathy when their blood sugar levels are not properly controlled. **The pupils will be dilated with eye drops in order to fully exam the retina. After the exam, the eyes will be light sensitive for a few hours. If you have sunglasses, please bring them with you. We offer complimentary slip-in sun protectors that that can be placed behind your own glasses. **Bring a list of your medications if you have trouble remembering them. Also, please give the doctor the name of your primary care physician and the doctor's fax number and/or phone number. Compliance is about following the guidelines for treating and managing your diabetes correctly through proper use of medications, healthy daily eating and nutrition, physical activity, and the monitoring of your blood sugar levels while striving to keep the blood sugar within acceptable ranges. Compliance maintaining appointments with your diabetes physician, the eye doctor, and dentist are critical. 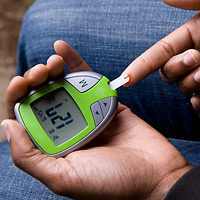 Studies show that the more compliant a person with diabetes is, the longer he/she stays healthy. The more controlled the blood sugar is on a daily basis, the longer the eyesight can be preserved.